Boston Oct. 11, 1670. My Lord: The relation which I am now presenting to your Lordship is of a very strange and prodigious wonder this last Summer in this part of the world; that the like hath not been known for the whole manner of it I do not remember that I have read or heard. There was a hill near Kennebunk river in the Province of Maine, the Eastern part of New England, which was removed out of its place, and the bottom turned upwards. The time is not certain when it was done, but that it is so is very certain, and it is concluded by those who live nearest to it that it was removed either the latter end of June or the beginning of July last. The relation I have from creditable persons respecting it, is this, that the hill being almost eight rods from Kennebunk river’s side on the West side of the river, about four miles from the sea, was removed from its place over the dry land about eight rods or perches, and over the tops of the trees also, between the hill and the river, leaping as it were over them into the river, where it was placed the upper part being downward, and dammed up the river till the water did work itself a passage through it. The length of the hill was two hundred and fifty feet, the breadth almost eighty and the depth of it almost twenty feet. The situation of the place as to the length of it was North West to South East. The earth of it is a blue clay without stones; many round bullets were within it, which seem to be of the same clay hardened. I have not seen the place myself, but sent purposely to enquire into the truth of what had been reported concerning it. I had this relation from Major William Phillips who dwelleth not far from the place, and Mr. Hartakendon Symons who went to the place and took very good notice and brought me the same report of the truth and manner of it, which I had before received from Major Phillip, in answer to my letter of inquiry, and told that the earth of the hill did not lie between the former place of the hill and the river, which seems to be as it were blown up by such force as carried the whole body of it so far together. I had from them some few of those round bullets which were found upon that now upper part, which was before the lower or inner bowels of the hill, as also a small shell or two, of a kind of shellfish commonly found where the sea flows, but how they should be within the hill is strange to consider. I have sent all that I had from thence to the Royal Society for their repository. I understand also from those parts, that there was no notice taken of an earthquake about that time, nor did I hear of any in any other part of the country. I give your Lordship only a relation of this prodigy as I had it, upon the best inquiry I could make, leaving the discussion of the natural causes which might concern a matter too hard for me to comprehend ; but the power of his Almighty arm is too manifest to all who weigheth the hills in a balance, and in whose presence the heavens drop, the hills are melted like wax. Sinai itself a moved. Your right honorable Lordship’s humble servant. Winthrop was governor of the colony of Connecticut from 1657–1658, and again from 1659 until his death in 1676. 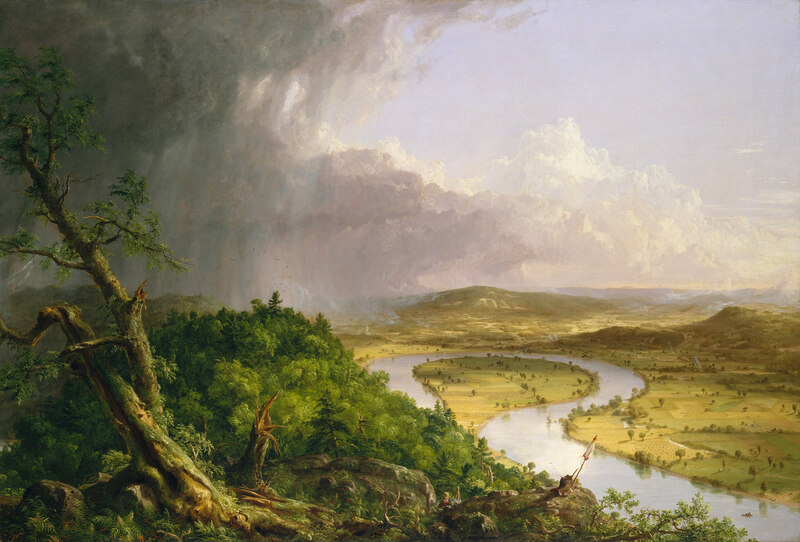 This entry was posted in Uncategorized and tagged 17th Century, 1830's, 19th Century, Art, Great Britain, John Winthrop Jr., Landscapes, Letters, Lord Brereton, Oddities, Painting, Rivers, Thomas Cole, USA. Bookmark the permalink.